I didn’t have high expectations for this race after being hit hard with either really bad allergies or a cold on top of allergies the past 10 or so days. I went for a gravel ride on Saturday since I had not been out riding much and was thinking I would feel quite a bit better than the prior weekend’s gravel ride – last week I was coughing so hard I thought I was going to puke up mucus – yep disgusting. I had high hopes, popped a Claritin and Sudafed only to feel like crap and really weak on the bike. But hey, as least I felt slightly better than last week! And on the upside, I would be well rested for Sunday’s race! Aaron and I got up bright and early Sunday morning to make the trek to Comlara Park at Lake Evergreen in Hudson, IL. We had our GPS set to Comlara Park instead of the specific area for mountain biking and almost ended up at Bible Church which apparently is also at the park. Luckily we were plenty early and found the trails with enough time to still pre-ride and not be in a rush. We got the bikes ready, kitted up, and headed to the start to see if the beginner race was finished and if it was ok to hop on the trails. Due to the timing chips in our number plates we were instructed to life our bikes overhead and walk to the side of the timing mat. Being the SAP that I am, I of course lifted my bike up but had my number plate over the mat. Sorry Tony!!! (And thanks Amy for telling me that Tony needed practice with the timing chip software to make me feel better!). We made it out of the features sections and onto some really fun and twisty single track, I loved it! There were a couple technical climbs with rooty uphills but I made it up them without problem. The climbs were the perfect distance, you had to work, but they didn’t completely kill you. And there was plenty of fast of flow-y singletrack to keep you smiling! I was starting to feel a little better about the race and was doing ok with just a Claritin. I lined up behind the expert/cat 1 men, and then all the ladies decided that it might be better to go behind the sport men, rather than deal with them catching up to us through the beginning skills section. So we moved back and lined up just in front of the sport women. I was starting to get nervous and was hoping to keep up on what would surely be a super-fast start and then not get too far behind in the technical section. I was talking with the other ladies and most of them could ride the features. The whistle blew and we were off! I took off and to my surprise was leading the group! I made it first into the singletrack with Ann (leader of the sport class) on my wheel. I thought for sure I would get passed or the ladies would catch up in this first section, but I was able to get a little gap. I keep riding hard and made it up to a few of the guys and got around them. I knew the more guys I could catch and get around the better. I wanted to get some distance. I made sure to really dig deep and push it in the open sections, never letting up. I learned my lesson a few weeks ago when I got caught at the end of the race and lost the fight for 2nd place by 4 seconds. I knew every single second I could get would help me. I managed to stay in the lead for the first lap and started on my second. The spectators were really friendly and I had plenty of people cheering for me, some by name and other yelled “Go Iowa!” There were a few points where I had thoughts pop in my head about being in the lead and maybe winning, but I squashed those immediately and stayed focused. There were still two more laps to go and the last time I was in the lead I managed to shear off my derailleur and DNF. I knew I had to stay focused and not let up. I passed by a guy in an open section and he told me I was riding really well and I’m pretty sure he called me a “tigress”- I laughed to myself. I made it into the singletrack for the third time and caught Beverly out of the corner of my eye; I was guessing I had about a 30-40 second gap, not enough to make me comfortable. I pushed really hard and tried to make sure she wouldn’t close that gap. I wanted to stay out of her sight and not give that extra motivation of being able to see the person ahead of you. On the fourth lap, I once again caught sight of her entering the single track and guessed that I still had about a 40 second gap. I reminded myself to keep focused. And kept telling myself “pain is just temporary” – some cheesy saying I pinned on Pinterest. It worked though and I never gave in or let up. I just kept pushing and pushing. Aaron finally caught up to me with about 1 mile to go. I asked what kind of a gap I had and he said it was big, but I didn’t believe him and kept riding as hard as I could. He told me latter he didn’t want me to get too worked up and crash trying to push myself too hard. At last I could see the finish line and I crossed in first place. 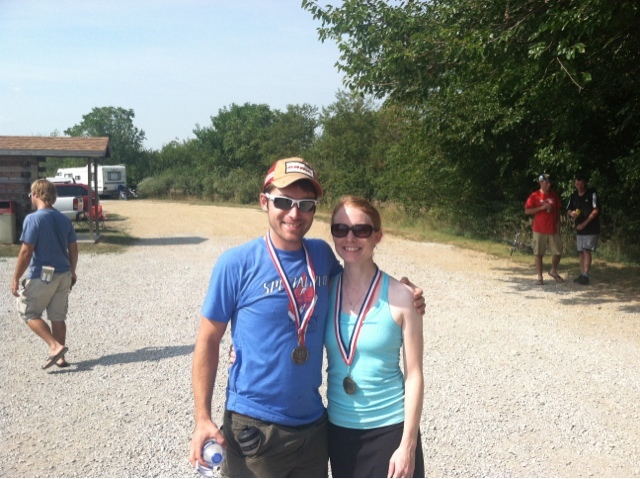 I finally won my first expert/cat one mountain bike race and Aaron won the expert/cat 1 men’s race! What a fun race and race course! 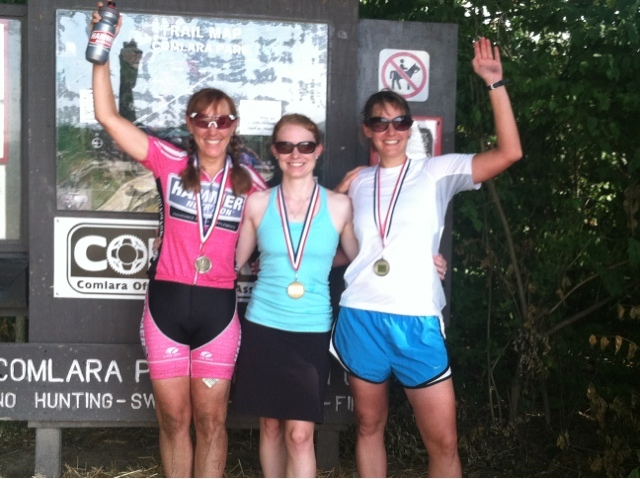 Beverly Enslow (2nd), Myself (1st), Rachel Furman (3rd). 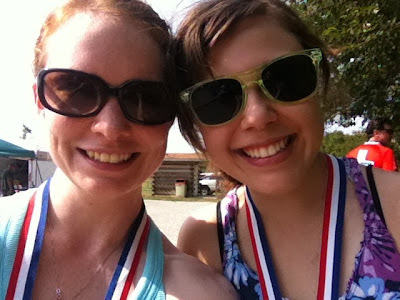 Awesome race ladies! 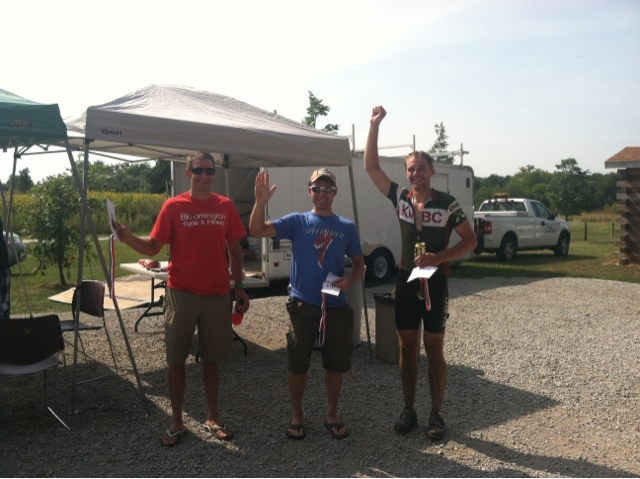 The Expert Men's Podium - Aaron Fader (2nd), Aaron Robnett (1st), Aaron Higley (3rd) - All Aaron's!! A guy in the crowd yelled out that he was going to change his name!